Because email servers that reside in the cloud deserve the same level of comprehensive security as email servers that reside on premises, it's advantageous to use Barracuda's proven email security solution that has the same technology and the same suite of features available in our award-winning hardware appliance. The Barracuda Email Security Gateway virtual appliance for Amazon Web Services is a comprehensive email content security solution that protects inbound and outbound email traffic with advanced email security and threat detection features that utilize Barracuda's real-time threat intelligence framework to guard against zero-hour malware, Denial-of-Service attacks and other threats. Barracuda Email Security Gateway uses zero-hour updates to ensure organizations remain productive in the face of evolving threats. Along with best-of-breed email threat protection, the advanced email management policies in the Barracuda Email Security Gateway for AWS offers Data Loss Prevention (DLP), scanning outbound emails and attachments, to block confidential or sensitive information from being leaked outside an organization. In addition to scanning email traffic, organizations can encrypt messages and leverage the cloud to spool email if mail servers become unavailable. This easy-to-use solution provides you with flexibility in deployment as well since installation time is minimal, and can be done before, during, or after your transition from an on-premises to a cloud-based email service. Email servers that reside in the cloud deserve the same level of comprehensive security as email servers that reside on premises, especially since cloud-based email servers are no longer wholly within a network space that you control. However, most cloudbased email servers usually offer only basic spam protection if at all, and lack the functionalities found in an on-premises email protection solution. 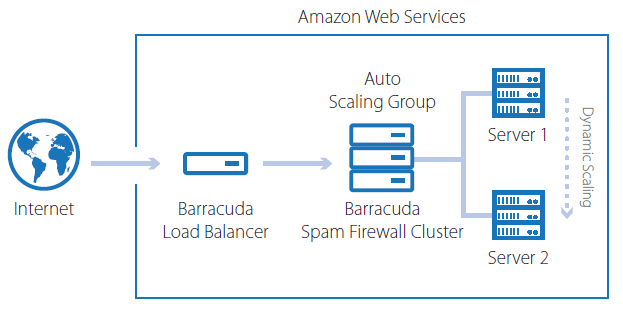 The Barracuda Email Security Gateway for Amazon Web Services is a proven email security solution that will fully secure your cloud-based email server using the same technology and the same suite of features available in our award-winning hardware appliance, without giving up any of the convenience and benefits of the cloud. Data loss prevention (DLP): Scanning of outbound emails and attachments, to block confidential or sensitive information from being leaked outside an organization. Email encryption: Ensures secure communication and regulatory compliance. Bulk Email Management: Our Email Categories feature gives YOU control over the types of solicited and unsolicited email allowed into your users' inboxes. Additionally, should your email server be unreachable for any reason, email continuity is offered by the Cloud Protection Layer (CPL) of the Barracuda Email Security Gateway. Emails can be spooled in CPL and re-delivered once the mail service is available. The separate CPL interface also allows for viewing and downloading of all incoming emails. This easy-to-use solution provides you with flexibility in deployment as well since installation time is minimal, and can be done before, during, or after your transition from an on-premises to a cloudbased email service. The experts at Barracuda Central work 24x7 to monitor and block the latest Internet threats. Data from more than 150,000 collection points is analyzed to create and deliver protection against previously unknown threats within minutes of their discovery.